Although it is new to the AKC, the Havanese is quite an old breed in “dog years”. Its history is fascinating and important to defining type, as it is unique in many respects. The Havanese is the National dog of Cuba and its only native breed. The flag of Spain was first raised over Cuba by Christopher Columbus in November of 1492. In the ten years following, colonization was begun on the island by Spain, who owned it for the better part of the next four hundred years. The first settlers came from two distinct classes- farmers primarily from the island of Tenerife, and the “segundos”, or second sons of the Spanish aristocracy. Ship’s logs of the early sixteenth century reveal that dogs were brought along on these early colonists’ voyages, and logic tells us they were most likely the dog of Tenerife, common ancestor to all the Bichon family. Because of the draconian trade restrictions imposed on its colonies by Spain, Tenerife remained one of the only ports open to Cuba for trade, and it would appear these little dogs, who soon found their way into the homes of the resident Spanish aristocracy, developed without much outside influence. They did, however, develop in response to the climate of this tropical island. The Havanese of today is still a remarkably heat-tolerant little dog, due in no small part to the unique coat. Once called the Havana Silk Dog, or the Spanish Silk Poodle, the coat is like raw silk floss, profuse, but extremely light and soft, and insulating against the tropical rays in much the same way that yards of silk sari protect the women of India. In its native country, the coat was never clipped for this reason, and the hair never tied into a topknot, as the Cubans believe it protects the eyes from the harsh sun. In spite of the trade restrictions, Colonial Cuba developed and prospered. By the 18th Century, it was the cultural center of the New World, with an elegance that surpassed anything the British had managed in ITS colonies! The aristocracy of Europe found the city of Havana to be a great vacation spot, with its operas, theatres and palacios. On their return to Europe, they brought back the little Dog of Havannah, which found favor in the courts of Spain, France and England. In both Spain and in the court of Louis XVI, they were shorn in the manner of poodles, and were much admired for their diminutive size. The English, on the other hand, appeared to leave them au natural, and called Portrait of Federico II Gonzaga by Titian.them the white Cuban, although they were as often found in parti-colors and shades of fawn. By the mid-eighteenth century, they were downright trendy in Europe. Queen Victoria owned two and Charles Dickens had one, beloved of his seven children and named Tim. They were exhibited in the early European dog shows and type was well-established. In Cuba meanwhile, the times were changing. The aristocracy of the sugar barons was dying out and a new class was emerging, the bourgeoisie, and the little dog of Havana, adaptable as always, became a family dog extraordinaire. It is a position he has held there for the past hundred and fifty years. Havanese History The Real Cuban Breed-Havanese dogs, the Havanese breed as we know today was originally brought to Cuba from the Mediterranean for the royalty and rich elite of Cuba. Today They enjoy the title of the National dog of Cuba. They are also referred to as the Bichon Havanese, Bichon Habaneros, or as the Havana Silk Dog. Their loving temperaments make them one of the most enjoyable dogs to own. They are very trainable and display their love of life every day. The Havanese, new to the AKC, is an old breed with title to a colorful history. The Havanese is the National dog of Cuba and its only native breed. The dog’s journey to Cuba most likely was aboard the trade ships sailing from the island of Tenerife chronicled in ship’s logs of the early sixteenth century. Cuban trade was highly restricted by the Spanish, for many years allowing Tenerife to be one of the only open ports, and it would appear these little dogs who had found their way into homes of Cuban aristocracy developed without much outside influence. The tropical environs of their homeland appears to have influenced the Havanese development, specifically their unique coat texture. Once called the Havana Silk Dog, or the Spanish Silk Poodle, the coat is like raw silk floss, profuse, but extremely light and soft, insulating and protective of harsh tropical rays. As Colonial Cuba developed and prospered the popularity of the Havanese grew. By the mid-eighteenth century they were trendy in Europe, often exhibited in European dog shows and type was well established. As Cuban culture shifted the little dog of Havana, adaptable as always, became a family dog extraordinare, playmate of children, watchdog, and herder of the family poultry flock. With the advent of the Cuban revolution, the class of Cubans who owned Havanese was the first to leave. A handful of them found their way to the United States, and by the end of the 70s a gene pool was being rebuilt. All the Havanese in the world today, save those from the “iron curtain” countries and those remaining in Cuba, stem from 11 little immigrants. Remarkably, through all their travels, Havanese type and purpose has remained virtually unchanged for the past hundred and fifty years. All of our Havanese dogs are raised in our home and never in a kennel. Havanese are a very loving toy breed and need the closeness of the family. We have found that early socialization is the key to a loving and happy Havanese dog. 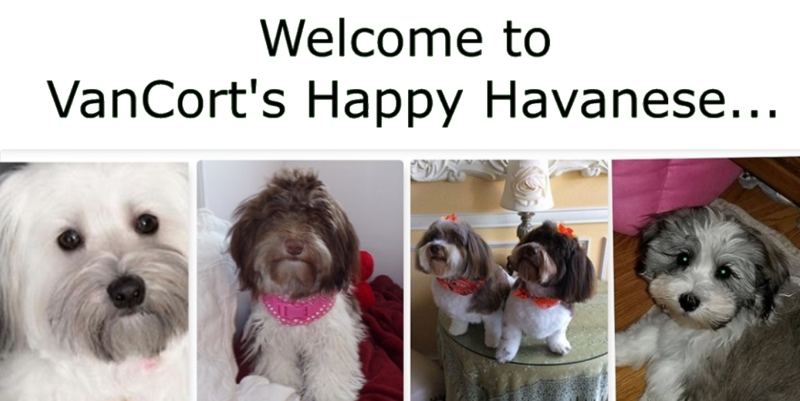 Havanese are loving and happy dogs. They do very well with other dogs, pets and especially with children. They also are great for apartment or condos. Havanese are a small toy breed ranging in six from 8 1/2″ to 11 1/2″ in height at the withers. They can vary in weight from 7lbs to 13 lbs.